Rothiemurchus, like the rest of the Cairngorms, is shaped by geology, climate, glaciers and early settlers but it is the Multiple Land Use Policy practised over the last three centuries that has resulted in an “unspoiled” environment. Taken together in terms of variety, wildness, intimacy and welcome this landscape is unrivalled. From 1954 the quality of the environment has been formally recognised by the 55,000 hectare of government designations that cover the 10,000 hectare of the estate; an average of 5.5 units of designation on every unit of land! Today protection and enhancement are achieved by looking after nature and people. This is helped by working closely with the government. Multiple Land Use respects all interests including nature and the enjoyment of nature in all aspects of economic activity. For example, the purpose of the Forest Plan is to enable management to safeguard biological diversity with a presumption toward improving conditions for rare species that are threatened elsewhere together with meeting recreational, social and economic objectives. By caring and hard work, we can ensure that the full range of habitats are protected and enhanced so that the landscape and species are conserved for future generations to enjoy. We invite visitors and others to engage in this conservation work. Working together, the public sector and Rothiemurchus Estate are determined to safeguard the future of this historic and beautiful Highland Estate. Public sector bodies and the private Estate of Rothiemurchus have come together to sign an innovative Concordat, sharing the responsibility to care and shape the future of this special area. As partners in the Concordat we share a vision of a living landscape, supporting the wildlife and the community and available for all to enjoy. We want people to enjoy the magnificent scenery and recreational opportunities. We also intend to enhance the distinctive habitats and species, which make this such a wonderful place. We also listen to and respect the views of local people and neighbours in shaping this vision. We all work very closely together to keep the natural environment healthy and to encourage a dynamic blend of land use with supports the local community in forestry, farming, tourism, recreation and sporting interests. Working in harmony, we plan to show how a sensitively and dynamically managed estate can contribute to the development and economic viability of the local community. We also appreciate the importance of the Estate in the regeneration of the Aviemore area as a quality tourist destination. Concordat partners include: Rothiemurchus Estate, Scottish Natural Heritage, Highlands & Islands Enterprise, Forestry Commission, Cairngorms National Park Authority, Historic Scotland, The Highland Council, The Scottish Government. Rothiemurchus Estate thanks the Cairngorms National Park Authority, The Forestry Commission Scotland and Scottish Natural Heritage for the payments they make for the delivery of public outcomes in Rothiemurchus. We also thank The Highland Council, Highlands and Islands Enterprise and the Scottish Government for the work they do and the funding they provide in and around the estate. 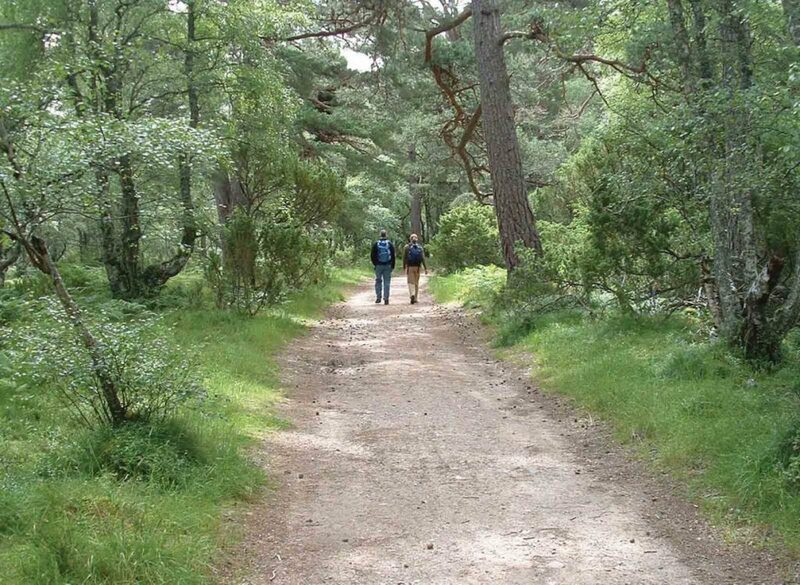 Care and management of the woodlands on Rothiemurchus is guided by a comprehensive forestry plan. A revised long-term forest plan for 2016-2035 has now been approved by Forestry Commission Scotland (with support through the Scottish Rural Development Programme). Download the Forestry Plan (2MB) or to download just the summary pages click here. Capercaillie Framework and What goes clatter, clatter, click, click, pop, pop in the woods? To understand the thinking behind the forest plan it is helpful to read “The forest, its ecology and future management” by Dr Phil Ratcliffe and reproduced here from “Rothiemurchus – Nature and People on a Highland Estate 1500-2000” by T C Smout and R A Lambert (1999). For 2016-2020 part funding for care of the native woodlands on Rothiemurchus and management for capercaillie is provided by the Scottish Government and the European Union. Rothiemurchus Estate Maintenance Trust was established to care for Rothiemurchus; its natural environment, its buildings and people. It was started by Johnnie Grant the younger of Rothiemurchus, in 1980 to enable the restoration of the Doune of Rothiemurchus. However, in 1984 its purposes were extended to care for the heritage of Rothiemurchus. How much is spent maintaining Rothiemurchus? Although Rothiemurchus covers about 40 square miles, the multiple national and international nature conservation, scenic, historic buildings and ancient monuments, designations, nominations and awards cover an area of over 200 square miles as there are an average of 5.5. ‘Designations’ on each piece of land. It’s important to note that although there are over 350,000 visits per year to Rothiemurchus only about 17% of visitors buy anything from an Estate or partner business. At present the annual expenditure is about £250,000 per year about half of which is paid by the public sector, however, the cost of looking after ‘the public benefit’ to meet a wide range of expectations in areas of this importance, has been independently audited as needing to be nearer £400,000. We really need your support to help care for Rothiemurchus. You can do this by becoming either a Friend or an Explorer, buying activities or from our shops. The money you spend goes towards caring for this fantastic place. No, there is a long list of buildings that require expenditure to safeguard them for the future, whilst in the past there has been public funding for path repairs this has not been provided since 2005 and there are massive opportunities for improving public outcomes on the estate. We would also really like to work on some projects in the future such as consolidating the walls of Loch an Eilein Castle, making the Cairngorm Club or Iron Bridge suitable for all abilities and improving the paths in the hills, such as the Lairig Ghru. You can help by becoming a Friend or an Explorer. You can also help by participating in activities on the estate, purchasing estate produce in the shop or by making a donation. Everything is extremely welcome. If you wish to send a donation please make a cheque payable to; Rothiemurchus Maintenance Trust, c/o Hugh Younger, WS, Murray Beith Murray, 3 Glenfinlas Street, Edinburgh EH3 6AQ. Will my donation be spent well? Of course, and any donations will be greatly appreciated to help maintain this superb place. Donations can be made free of capital gains and inheritance tax. The trust is supervised by the Treasury, expenditure is audited by Chartered Accountants, and the trust is administered by the Trustees including a solicitor and the National Trust for Scotland.